His Royal Highness the Prince Regent and Duke of Wellington etc etc. 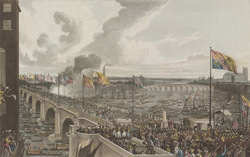 First Visit to Waterloo Bridge, on the 18th June 1817.
bl.uk > Online Gallery Home	> Online exhibitions	> King George III Topographical Collection	> His Royal Highness the Prince Regent and Duke of Wellington etc etc. First Visit to Waterloo Bridge, on the 18th June 1817. This visit by the Prince Regent and Duke of Wellington was to open the newly built Strand Bridge in London. It was on 18th June 1817, the second anniversary of the Battle of Waterloo. Waterloo Bridge, links Victoria Embankment to Waterloo in London. The bridge was built between 1811-17 by contractors Joliffe and Brown to a design by architect was John Rennie. It was originally called Strand Bridge but a 1816 Act of Parliament changed its name to Waterloo in 'remembrance of great and glorious achievements'. In the background is Westminster Bridge with the outline of Westminster Abbey and Hall.